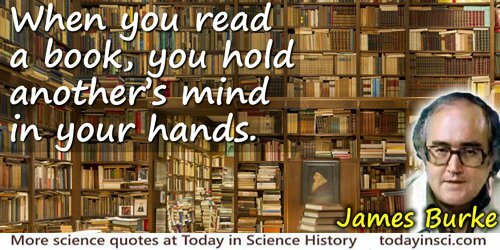 Science historian best known for his 1979 TV series, Connections. 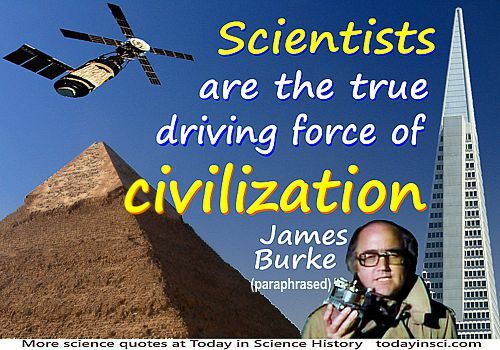 Scientists are the true driving force of civilization. As stated in Cosmic Search (Fall 1981), 3 No. 4, 18, which cites James Burke, Connections. It seems to be a paraphrase. Compare narration in TV program 'Yesterday, Tomorrow and You', episode 10 of Connections (1979): “The scientists and the technologists … are the true driving force of humanity.” If you know a primary source for the short form, please contact webmaster. 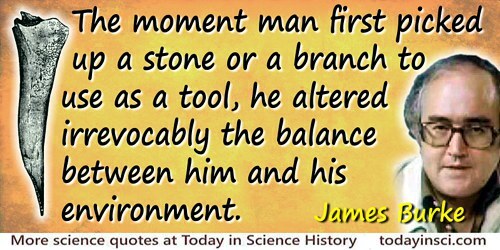 We in the modern world expect that tomorrow will be better than today. In Day the Universe Changed (1985), 19. Appears, without citation, in Helen Grenat, Wisdom Through the Ages (1998), 28. In Connections (1978, 1979), 287. 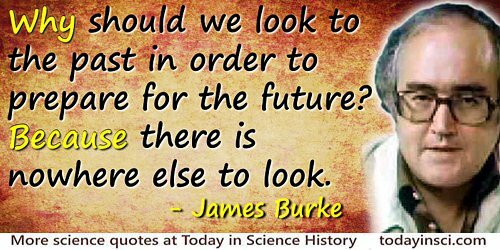 22 Dec - short biography, births, deaths and events on date of Burke's birth.